When monitoring your infrastructure, there are two paths: you can monitor from the inside or from the outside. The whole Enterprise product is mostly a monitoring tool that allows you to know what’s happening inside. The Webcheck feature helps you monitor your applications from the outside. It allows you to configure any endpoint to be checked by our workers. It can be a http, https or tcp application. Of course like the alerting system, you are able to get alerted on few metrics like the latency of your application. You can also choose how and who will receive a notification. 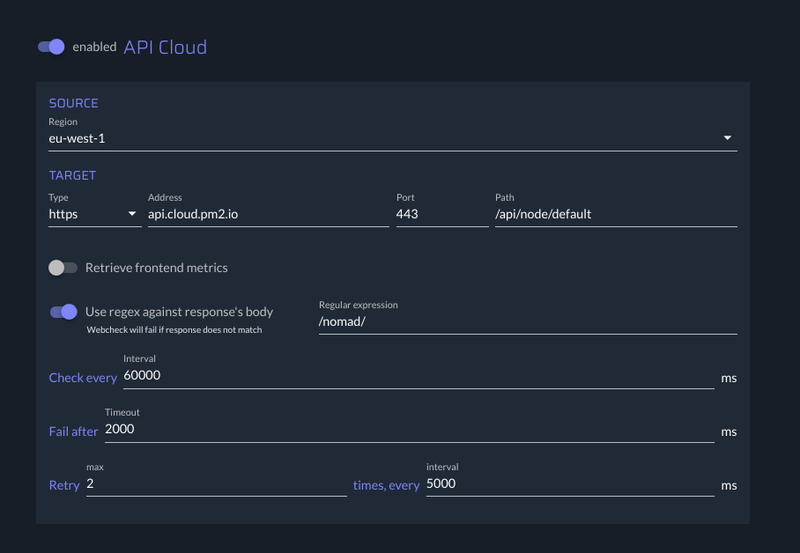 When providing API to your customers, you want to make sure they are available and not too slow. You can add a webcheck on specific routes and get alerted if they cross a specific threshold. When creating a webcheck, you can enable the toggle the Retrieve frontend metrics which will load your endpoint in a chromium browser to verify the time it takes to be interactive and few other key metrics for your users. In the following documentation, there are no specific requirements except that your endpoint need to be exposed to internet. Retrieve Frontend Metrics: If your endpoint is a web app (not an API), you can ask us to retrieve important metrics about it. Check every: By default we will check every minutes but you can slow it down if you want. Fail after: Its the timeout, if we fail to connect to your endpoint after this duration, we will consider it as down. Retry & Interval: In case of failure, you might want to retry to be sure thats its down and not a bug. Note: The state metric is the one thats representing the webcheck, if it’s at 0, the webcheck failed, otherwise it’s up. state http,https,tcp false The result of the webcheck is represented by the state metric, which can be either 0 or 1.
httpCode http,https false The actual HTTP code that the endpoint answer when the webcheck make a request. Like in the Alerting feature, you can setup a custom threshold depending on the metric. By default we only send an alert when value cross the treshold (and not everytime it’s above it), you can change it via the Trigger configuration of each alert. Can i send different actions depending on the alert? No, we don’t currently aim to implement this possiblity to keep the feature relatively simple. We are totally open to implement other components, please contact us so we can discuss that ! We are currently working on optimizing the fetching of metrics so it can be faster.